علی‏رغم ورود فناوری اطلاعات و ارتباطات (ICT) به بسیاری از روستاهای ایران، هنوز خیلی از قابلیت‏های این فناوری در بخش روستایی به دلیل نبود شناخت کافی دربارة عامل‌های پیش‏برنده و بازدارنده، توجه چندانی به آن نشده و همچنین از آن به‌صورت شایسته بهره‏برداری نشده است. در واقع، بدون شناخت عامل‌های مزبور، هرگونه اقدامی منجر به هدر رفتن منابع مادی و انسانی خواهد شد. از این‏رو، تحقیق حاضر با هدف تحلیل عامل‌های پیش‏برنده و بازدارنده گسترش فناوری اطلاعات و ارتباطات در روستاهای بخش مرکزی شهرستان نجف‌آباد از دیدگاه کارشناسان صورت پذیرفته است. روش پژوهش توصیفی و از نوع پیمایشی است. جامعة آماری تحقیق شامل همة کارشناسان جهاد کشاورزی، پست، پست‌بانک، مخابرات و دفترهای فناوری اطلاعات و ارتباطات روستایی(55 نفر) است که به‌صورت سرشماری بررسی و تحلیل شدند. اعتبار پرسش‌نامه با نظر متخصصان و پایایی ابزار تحقیق با ضریب آلفای کرونباخ برای هریک از مقیاس‏های اصلی پرسش‌نامه در حد مناسب (بالای 9/0) به‌دست آمد. براساس نتیجه‌های حاصل از تحلیل عاملی، چهار عامل فرهنگی- اطلاع رسانی، زیرساختی، خدماتی و تسهیلاتی- نهادی به‌عنوان عامل‌های پیش‏برنده با درصد تبیین 17/73 و چهار عامل ضعف زیرساختی، ضعف فرهنگی، توسعه‌نیافتگی اجتماعی- منطقه‌ای و ضعف مهارتی- تخصصی، با درصد تبیین 49/58 درصد به‌عنوان عامل‌های بازدارنده گسترش فناوری اطلاعات و ارتباطات در روستاهای شهرستان نجف‌آباد، شناسایی شدند. Despite entering ICT in many villages of Iran, many capabilities of this technology in rural areas has not been paid much attention and exploitation due to lack of recognition of driving and hindering factors. In fact, without recognition of mentioned factors, any action would result in the loss of human and material resources. Accordingly, the purpose of this study was to analyze the driving and hindering factors of ICT development in villages of central part of Najaf Abad County. The study is a descriptive and survey research. The statistical population of the study consisted of all the experts of Jihad-e Keshavarzi, Post, Post bank, communication and rural ICT offices (55 people). Validity of the questionnaire confirmed by experts’ view and reliability of research tool measured by calculating Cronbach-Alpha coefficient (over 0.9). The results of factor analysis showed that four factors including cultural - information, infrastructural, service and facilities - institutional determined as driving factors explained 73.17 percent of total variance and four factors including infrastructural weakness, cultural weakness, social-regional underdevelopment and technical- skills weakness determined as hindering factors of ICT development in villages of central part of Najaf Abad County which explained 58.49 percent of total variance. اسدی ع.، شریف زاده ا. و مراد نژادی ه، (1386)، «در‌آمدی بر کاربست فناوری‌های اطلاعات و ارتباطات در توسعه روستایی»، تهران. برقی ح. و قنبری ی، (1389)، «تحلیلی بر نقش علم و فناوری اطلاعات و ارتباطات در توسعه روستایی»، راهبرد یاس، 24: 145-135. پاپ‏زن ع.، زرافشانی ک.و راسخی ب، (1386)، «چشم‌انداز گسترش فناوری اطلاعات و ارتباطات در مناطق روستایی شهرستان کرمانشاه»، روستا و توسعه، 4: 229-199. پورآتشی م. و موحد محمدی ح، (1386)، «عوامل بازدارنده استفاده از فناوری اطلاعات از دیدگاه دانشجویان تحصیلات تکمیلی رشته­های کشاورزی»، علوم ترویج و آموزش کشاورزی، 3 : 119-107. عزیزی خالخیلی ط.، بخشی جهرمی آ. و بیژنی م، (1390)، «رفتار حفاظت خاک کشاورزان: نقش رسانه‌های ارتباطی و اطلاع رسانی»، علوم ترویج و آموزش کشاورزی ایران، 7 : 61-51. عمادی م. ح، (1384)،« نقش فناوری اطلاعات و ارتباطات (ICT) در تسریع فرایند توسعة کشاورزی»، جهاد، 269: 64-56. کلانتری خ، (1390)، «پردازش و تحلیل داده‏ها در تحقیقات اجتماعی-اقتصادی با استفاده از نرم افزار SPSS»، تهران. Adeya C. N. )2002(. ICTs and poverty: A literature review. idrc’s acacia initiative. Annual asia pacific advanced network conference. Malaysia. 89p. Bakhshizadeh H., Hosseinpour M. and Pahlevanzadeh F. (2011). 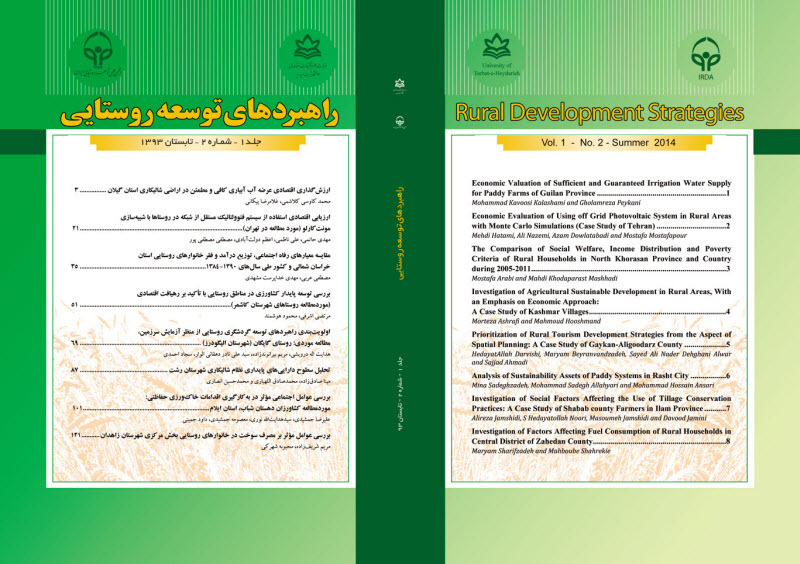 Rural ICT interactive planning in ardabil province: sardabeh case study. Procedia Computer Science, Published by Elsevier Ltd. 3: 254–259. Cecchini S. and Scott C. (2003). Can information and communications technology applications contribute to poverty reduction? lessons from rural india. Information Technology for Development. 10: 73–84. Chitamu P. J., Ra van O. and Vannucci D. E. (2003). how can the cost of telecommunications access in africa be driven downwards? Southern african telecommunications and applications conference (SATNAC), Proceedings (CDROM), ISBN 0-620-30949-0. 7-10. FAO. (2007). E-agriculture should focus on information over technology say respondents in recent global survey - emailed from charlotte masiello-riome to the communication initiative. Annual asia pacific advanced network conference, Malaysia. Fourie L. (2008). Enhancing the livelihoods of the rural poor through ICT: A knowledge map. Working Paper No. 13, infoDev, South Africa Country Report. International Telecommunication Union (ITU). (2013). Measuring information society executive summary. International Telecommunication Union. Available at http://www.itu.int (Last access: 18 January 2014). Johnson G. A. (2011). Understanding the role of data 'information, knowledge and wisdom in site - specific management. Proc. North Central Weed Science Society. 52: 175. Malcolm. L. R. (2010). Farm management economic analysis: a few disciplines, a few perspectives' a few figuring’s, a few features. Annual Conference of Australian Agricultural and Resource Economics Society, Sydney. 46p. NovoCorti I., Varela Candamio L. and Garcia-Alvarez M. T. (2013). breaking the walls of social exclusion of women rural by means of icts: the case of ‘digital divides’ in galician. Computers in Human Behavior. Available at http://dx.doi.org/10.1016/j.chb. (Last access: 17 January 2013). Saadan K. (2010). Conceptual framework for the development of knowledge management system in agricultural research and development. Asia Pacific Advanced Network Conference. Malaysia. Temel T. and Maru A. (2007). ICT infrastructure and use in agriculture, agricultural policy, research, and education organizations. Food and Agriculture Organization of the United Nations. GEORGIA. International Service for National Agricultural Research 2010 Social Science Electronic Publishing.